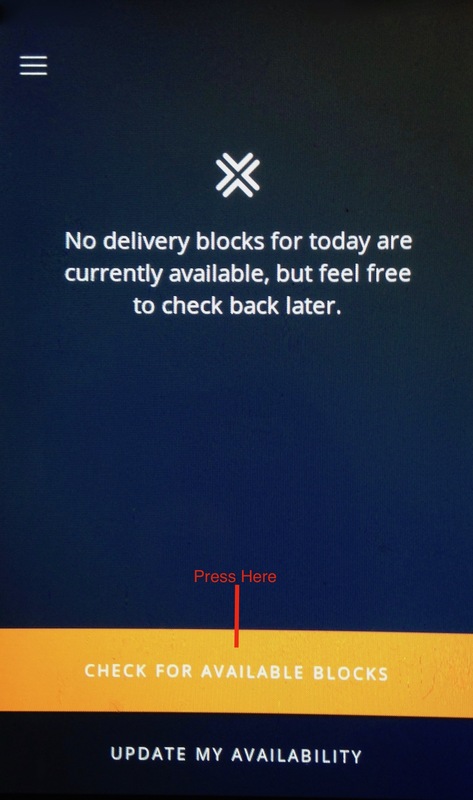 With the recent update to the Amazon Flex Delivery App, I spent most of the day making sure I understood exactly how it was going to impact the method of picking up blocks. I saw a few more blocks than usual come available today, so things are certainly off to a good start. Maybe the update caught a few drivers off guard and they are taking longer to adjust? Either way, the method hasn’t changed very much. It is still all about the refresh. I tried three methods today that I will share. Two worked very well. One…not so much. Remember, there are other factors that come into play that will affect each of us differently. These factors include phone models, internet connection, timing and luck. So definitely work through these and figure out which works best for you. Some people said they had luck today with this method, but for some reason it did not work for me. I’m not quite sure if my screen was refreshing, even though the spinning circle showed up. Maybe it has something to do with my phone model? I spent a lot of time swiping my screen and didn’t see one available shift appear. That’s not to say I won’t try this method again. It is definitely the simplest of the three, but for now, it’s on the back burner. You would continue the progression above until you see a block appear on the offer screen. You know it’s coming if you get to the third screen and the words below the Flex symbol are missing. The third method I used today was “pinning.” This gave me my greatest success. If you aren’t familiar with the term you can read about it here. For this method you keep refreshing the pinned home screen using whatever button your phone requires. The screen you pin and continue to refresh is the home screen. It will look like the first screen below. Once you see the second screen it means there are offers available and you would immediately push the Check For Available Blocks. I did not see any next day blocks come across. That’s not to say they weren’t there, I just didn’t see them. I saw a lot of blocks during the same time frames in which I normally focus. I wrote about these windows a few months ago here. I saw some 3 hour blocks that I had not come across very often with the previous app. Maybe there were system limitations before? Definitely pay attention to the block date, start/stop times and duration. For now that’s all I’ve come up with. I hope the above is at least a starting point to see which method works best for you with the new update. As always, please share any of your findings here as well. I would definitely like to thank all the people that gave such great advice in the comments of the last post. Hopefully as we can all continue to help each other out. *We’ll see what happens tomorrow with the shifts going out for next week. It will be interesting to see how the update affects scheduled blocks. I will do my best to post what I find. Columbus, OH has been slow. I am a part timer so I can not afford to swipe 24/7 or hang out at the warehouse. Have found Postmates to be much less frustrating and much more reliable. $15 an hour in the hand is worth $25 an hour in the bush! If you don’t have any scheduled blocks, the only way to pick up blocks is to use one of these methods in this post. It is time consuming, but that is why I’ve always considered picking up the shift the actual “job.” You can also check out some older posts concerning the best times that I’ve found to look for shifts. With this new update I’ve found them to still be relevant. Check out this post, here. But I don’t even see a Home page on my app? Shouldn’t there be a Home page if it’s working correctly? Your home page should look like this here. That’s my point — it does not look at all like that — and nothing I do gets any kind of response from it. Nothing happens no matter where I touch the screen. In other words, I cannot specify where I want to deliver or get ANY RESPONSE AT ALL from the app. I agree then that the app is not functioning properly. Have you tried to delete and reload? Also, did you check the the download on your iPhone? You can go to this site using that phone to see if it will load. Go through the process like you are signing up and it will realize you have an account and give the link. Yes — I deleted and tried to re-install the app but get the same (lack of) results. … seems like an odd name if it’s the Amazon Flex Driver app. The current app version I have is 3.0.4275.2. Try getting the link from the site in my last response and see if the version is the same. Or maybe you already have? Did you figure anything out yet? Was this ever answered? I am having the same issue. I went to the https://flex.amazon.com/get-started link — but the latest frustration is that Pittsburgh is not on the list of available cities. When I click on “My city is not here” I’m taken to a page that says ‘Sorry, delivery opportunities aren’t available in your area” and invites me to provide contact info so they can let me know “when opportunities become available”. If THAT is the reason why the app does not seem to work, why did they accept my application information four weeks ago and do the background checking?? I’ve had the impression of Amazon being a “together” company. That impression is taking a real beating right now! Have deliveries begun in your city? Sometimes the company gets ahead of themselves and onboards drivers prior to opening a warehouse. It has happened in places like Brooklyn among others. There have been drivers that were able to download the app and thought they would get immediate shifts, but the site was not yet ready. In one instance it took about a month before the new warehouse was opened and blocks were offered. 1) There are three “Amazon Locker” locations near Pittsburgh — east, north, and south. They are not particularly convenient to the city but are “in the area”. Each one would be about an hour’s drive from downtown. 2) Regarding a personal order last week — it arrived via a young lady in a completely unmarked Grand Cherokee. Is it safe to presume she was Amazon Flex? 3) A friend of mine started looking into Amazon Flex in Pittsburgh back in JULY. He never followed thru with them (or vice-versa) but they were accepting application info as far back as that. Around noon today I sent an email to amazonflex@amazon.com. I’m not particularly surprised that I’ve not received a response. Someone else suggested trying amazonflex-support@amazon.com. Do you know if either of those addresses ought to be worth a dam*? By the way — I don’t know who exactly you are or what your affiliation is — but I really appreciate the way you’ve been trying to help. I would use the amazonflex-support address to get assistance. You need to select the area first, then it will give you an option to see the home screen. Quick question. If I have a block for the following day 8-12 will offers still be available to be? I’d rather start at 7 or 730 but I don’t want to sit on the app if nothing is going to come up. Sorry for the delay. Yes, offers will still be available to you. If you already have an 8-12 you can still pick up blocks around those hours. Check out this post about linking blocks here. Thanks for the reply. With the new update you take what you can get and what I got was an 8-12 block. What I’m asking is now that I have this block will I still be eligible to see a 7-11 block if it were available, take it, and forfeit the time I have now. You will not see a conflicting block offered. You would have to forfeit your current block before you will see offers during that same timeframe. Just a heads up for San Antonio drivers. I’ve noticed that blocks have been released 24 hours in advance. So far I’ve only noticed them being released at 830 and 9. The other day I was also able to pick up a random shift for 130. I’ve been refreshing by tapping on the lower part of the offers screen and it’s worked well for me. Hope this helps someone. Also, has anyone heard if they’re paying more to work on Thanksgiving? CH, thanks for commenting! I haven’t heard anything about base pay being increased for Thanksgiving, but it’s certainly possible. Thanks for posting the info, Blaacela. The best thing to do is be dependable, honest, efficient, and check for blocks early in the morning like 7 am or 5 or 6 if you are up. I do not believe Amazon ranks its drivers on speed, different drivers get different routes, different locations, amount of packages etc. the best block i have ever had was like 20 packages in a 4 hour block and finished it like an hour or so, i like to keep delivering until im done but sometimes i take time out to go to the gas station or McDonalds if i am hungry etc. One Good thing is that i usually finish all my blocks in 4 hours or less, so Amazon is a good company they dont really pile alot on you and some cars can carry less packages then others so they might finish sooner, i drive a Toyota Prius so i can fit more packages then most cars that do not have foldable seats and use their trunk, but for that reason Amazon does not pile work on me. During the election there was very little business and they were hiring and i believe they were using mostly new people to have them trained for the holidays. Take with a grain of salt most of what you hear on here there is alot of false information and confusion going on. I am not the fastest driver and i get blocks when i want them for the most part but it was slow for a week that i had off. The cool thing I have found about this job is that although it is competitive to get shifts, for the most part the drivers understand that it essentially comes down to luck and persistence, so there are no hard feelings or worries that some are being treated better than others. This breeds a camaraderie between drivers that makes you root for each other and congratulate one another on huge weekly paydays! You have a good attitude, rock on. Thank you. It seems you do as well. I wish you the best. Again for any Baltimore drivers: from my 10:30-2:30, they updated another block earlier in my shift. Around 11:30-11:45.i was already scheduled so I couldn’t get it. Also a 2nd shift was available around 4:30-4:45. Couldn’t accept that cause I was already at my part time. But from what I noticed today, I haven’t received ANY notifications about blocks until I accept the first 10:30 block earlier this day. Maybe this will help someone else out. If I get another shift, I will update again. Thanks for the tip! I used to be able to pick up a bunch of shifts, but since the update have only been able to pick up a few. I was hoping black friday and cyber monday were busy, but only was able to get a random 3 hour shift today. Sanantonio flex- I mean I agree, but just because I share it, who’s to say that others will still remember or even get an available block themselves. I could still beat half the people. Before the whole update I was literally making the $504 weekly (before taxes or course) I always had a shift. But like I said, I do understand you. We just tryna look out for others but watch ourselves first. so I just signed up and was approved in Columbus, OH area last week. I wasn’t offered any blocks at last Friday, (I’m not really needing work from this, I just wanted to pick up extra cash from time to time), and I periodically refresh the app throughout the day. For the first time tonight, three 1-2 hour blocks popped up for 8:30pm-9:30/10:30 at 8:21 pm. Is it normal for blocks to show up that close to the start? I can’t even make it to the warehouse then to the delivery area within an hour. I might be totally out of the block waiting game if that is the case. Yes, you will see blocks like that often. On occasion the warehouse will wait until the last minute to put out blocks in an effort to make sure they aren’t over staffed. The hope is that there are drivers nearby who will take the shift. Most of the time there will be. I have seen a few times though where they waited too long and had to send warehouse workers out. Looking for blocks about 20 minutes before they begin works well with late shifts. Of course, like you said, you need to be in the vicinity. As far as your goal of picking up extra cash, I think you’ll find that the amount of pay for number of hours worked is pretty good. It will take some effort though. Remember, this job is about getting the blocks. Delivering is the easy part. Hope you get dialed in soon. Just updating from last month. I finally received my first reserved offers for this week, so I worked my first block today. I was offered a little over 30 hours this week. Both for prime now and restaurant. Surprised. I come across loads of offers throughout the week, but with the same theme: less than ten minutes to the shift. Our market’s prime now warehouse won’t let people just hang out and wait for blocks–they have to have a scheduled block to be on the property. I assume because the order processing room is tiny. I will be trying out a hot wheels shift next. One of the other prime now flexers said he only had one order for his whole restaurant shift. I am interested to see how it goes. Frankie, thanks for the update. Nice to see the 30 hours offered. As far as the blocks releasing with less than ten minutes to arrive at the warehouse, is there a safe area nearby that you can sit and wait for those? It may be a great strategy if you are so inclined. I wrote about positioning yourself in this post here if you haven’t read it. Keep up the great work. Baltimore location : At 8:55 am, 2 shifts were available for 10 and for a 10:30 am. Both were 4 hours. But to everyone else: I seem to have better luck picking up shifts like 2 hours prior to the arrival time. I don’t find any blocks 24 hours beforehand. I just returned from my first block and everything went well except I was having trouble differentiating Attended vs Unattended deliveries through the app. None of my Prime Now deliveries specified Attended or Unattended, they just said “Delivery”. I did have one Restaurant delivery, and that one did specify “Delivery – Recipient must be present”. Is this the indicator that it is an Attended delivery, and the other ones can be assumed Unattended? I did call support on one Prime Now delivery because the recipient didn’t answer the door, and the rep did tell me the delivery was an Unattended one and that the package should be left at the door. Has anyone else noticed the updated app being unclear about Attended vs. Unattended, or is there another area of the app that I need to be looking? When it just says Delivery it is Unattended. The Recipient must be present message is the indicator of an Attened delivery. Thank you so much Jessica! I was starting to get that feeling when people seemed surprised that I was still at the door lol. Good lookin out! Hello there! You seem so helpful (much more than the “help” section in the app), and I was hoping you could give me some insight, please. I have been approved to deliver, and have actually seen a block or two come up that I wasn’t available for, but not for at least 2 weeks! I have never received the supposed Friday e-mail with blocks tailored for my availability either. Should I be concerned that I have the app installed wrong? I am in Tampa, FL and can’t really seem to find any info for this area. Thank you SO much for any help you can provide! Hi Angela. The blocks that come out on Fridays are for the work week going from Sunday to Saturday. It is not an email. You set your availability calendar and if you have any offers for the times you listed, they will show up sometime Friday afternoon on the offers screen. So today, the schedule for Sunday the 4th through Saturday the 10th came out. If the grey dots disappear and you have no blocks listed then you were not selected for a scheduled block. If you have an offer and you confirm it you will then see an orange dot on that calendar day. If you are like many, you won’t see many scheduled shifts, so you will need to keep refreshing the offers screen to pick up same-day or next-day blocks. I hope this helps. I received assigned blocks, usually 2 blocks per week for the first 4 weeks then nothing for about 3 weeks. I think it’s so new drivers can get things figured out then you get tossed in the deep end with everybody else. I’ve been able to fish for blocks ok but its about persistence. Id like tp know is there a guarantee on tips…..My omly question. No, I haven’t seen any notes on upcoming days with extra pay. Usually it’s only a couple of dollars per hour, so those rates look great! It would be nice if we could all pick up a few of those. Thanks for sharing. Any updates, Gerry? Seen that kind of shift again? I have not seen the 54-68 rate pop up since I saw it that first time. I was at the main warehouse in San Diego and no one knew anything about it. Might’ve been some promotion. On Jan 1 I received an email that a 42-56 rate would come up at the 4pm-6pm block. Other then that it’s been the normal 36-50 for each 2 hour block. Anyone living and flexing in the UK (croydon), need some tips on getting more jobs! I’ve already contacted them about this but haven’t gotten a reply back yet. Any recommendations of what I could try? I haven’t seen this error before, but maybe someone reading this can chime in. Hope you get it sorted. Thought i would ask here. I have been given 2 reserved blocks, starting about 30minutes apart on the same day. is it possible or even allowed to accept both? Not if they overlap. You would have to accept one or the other. After login, I only see a screen asking “Where do you want to deliver?” … with an area directly under that one (on the same screen) that says “Sorry, there aren’t any delivery openings in your area at the moment. Check back in the next day or two.”? I cannot see a drop down box or any menus to select delivery area. I cannot swipe the screen or do anything once I get to this point. I just don’t understand how the app knows there are no deliveries in my area when I can’t select a delivery area here in Houston. Any suggestions would be helpful. I’m using Android version 7 on Samsung phone with 4GB RAM. Following. I’m having the same problem. It pretty much stays frozen on the “Sorry no Delivery Blocks” screen until I am logged out due to inactivity. There is no way to refresh or go to a home screen or log yourself out or anything. Recently started amazonFlex and with the new all there now is a refresh button at the bottom of the screen. Besides “pinning”, is there no mechanism that auto refreshes a certain screen … that would then take the form of receiving a notification since the Offers screen would auto refresh every 30 or 60 seconds?